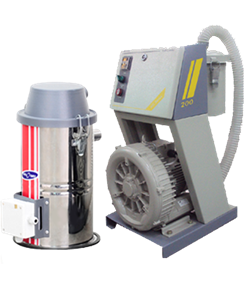 Aerodry AVL Series Vacuum Loaders are specifically designed & manufactured to suit the tough industrial conditions for conveying of bulk plastic materials to single as well as multiple machines. Loaders are available in options i.e. Ratio, Duo, Tria, Quatra , Centralized plant with raw material Silos..
Side Channel blower with silencer for silent operation. SS Flapper valve with level switch for material discharge. Cyclone body made of mirror class SS304 stainless steel. Easy to handle SS pickup nozzle. Dual Filters to avoid dust pollution. Audiovisual alarm to draw operator's attention. Ratio, Duo,Tria, & Quatra Loader option available.